NHS trusts have been warned they could face intervention by the Health Secretary after a survey showed that pressure to save money has led to restrictions in access to non-urgent procedures. Health Minister Simon Burns said rationing treatment on grounds of cost was "totally unacceptable" and decisions as to whether and when to treat patients should be on clinical grounds alone. "It has got to be simply a clinical decision as to when a patient receives their treatment," he told ITV Daybreak. "We have had the chief executive of the NHS David Nicholson, the medical director, writing to the trusts to tell them in no uncertain terms that the only criteria must be a clinical decision not a financial one. "Ultimately if we find evidence that they are ignoring that, then the Secretary of State does have the powers to intervene." Mr Burns' remarks were made after a freedom of information request lodged by GP magazine showed that pressure to save money had left 90% of primary care trusts restricting procedures including hip, knee and cataract operations, weight-loss surgery and tonsillectomies. The medical magazine said information released by 101 of the 151 primary care trusts showed nine in 10 had procedures to restrict GP referrals for procedures thought to be non-urgent or of low clinical value. 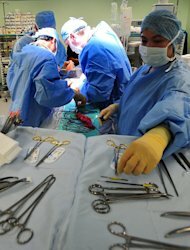 Limits on cataract surgery have been ordered in two-thirds of trusts, while six in 10 restricted weight-loss surgery and hip and knee operations.